When I attended this talk recently at the Nimbus Ninety conference, Work Reimagined, I thought it was going to be about how edtech start-ups are disrupting the traditional educational publishing landscape. It actually turned out to be about disrupting the education system itself and the speaker Paul Clarke presented a call to action detailing what was wrong with the current model and how it needed to change. The UK is currently facing a digital skills deficit and he argued we need to improve the pipeline by teaching digital literacy in schools in order to prepare future generations for a rapidly evolving job landscape. 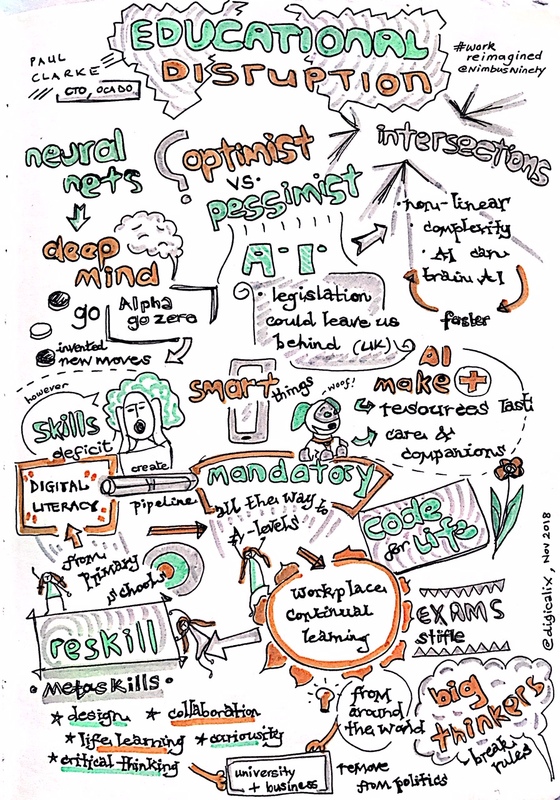 With the rise of machine learning (ML) and artificial intelligence (AI) the need to develop meta-skills which are transferable between jobs is essential, as well as to cultivate a love of lifelong learning as re-skilling multiple times throughout a career will be necessary for survival. Meta-skills such as creativity, collaboration, critical thinking, communication, and flexibility are deemed important as they are transferable across different disciplines. Paul’s suggestion of improving the pipeline was to make digital literacy a mandatory part of the school syllabus to equip everyone with the right skills and attitude of curiosity required for the 21st Century work place. This seemed at odds with the Generation Z discussion that preceded his talk, where members of the panel spoke about their experiences of school and business. The two ‘academic’ students ended up leaving school at 16 to pursue their own business ideas, whilst the two traditionally ‘non-academic’ students were pursuing post-16 studies at the Ada, the National College for Digital Skills. All were in agreement that the current style of teaching and range of subjects did not allow enough freedom of choice or encouragement for intrinsic learning: everything is geared towards core subjects and learning just to pass an exam. They were asking for more choice in schools, to learn in their preferred way, and to have support for non-traditional pathways such as entrepreneurship. I agree education needs to change and to put the learner at the centre with options and choices and making topics mandatory could have the opposite effect. Finally, Paul advocated linking businesses with schools so that pupils can connect with topics in the real-world and not just in abstract scenarios which echoed sentiments expressed by the Gen Z panel. When students embark on their professional lives, they will need to be responsible for their own learning and to invest time and energy in continually developing themselves to navigate a changing career path. Businesses that prioritize learning by investing in training (of the employee’s choice) and by encouraging work time to dedicate to learning, could end up with a competitive advantage. In the education division at OUP, we have meeting-free Fridays dedicated to having space to think, learn, plan, and develop our ideas. We have access to great online learning tools such as Lynda.com where we can choose from a wide range of topics to study. Having the time to learn is motivating and I love hearing from my team about what they are studying and how this will feed into their personal and career development, whilst preparing them from the inevitable changes that technology continues to bring. ← What can we learn from the OCR A Level Religious Studies examiner reports?